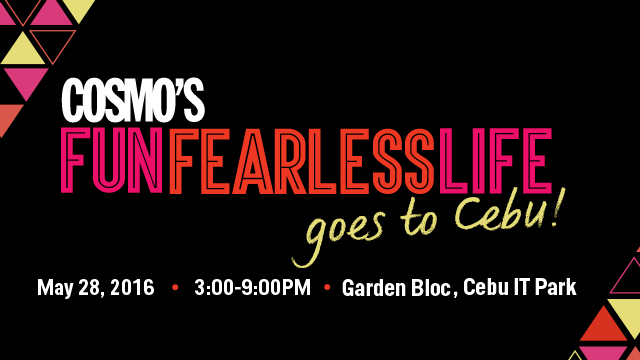 Cosmo Brings The Fun Fearless Life To Cebu! Meet the editors and the biggest names in the industry on May 28 at The Garden Bloc, Cebu I.T. Park! We’ll kick off the weekend by visiting the hottest radio stations in Cebu on May 26, so make sure to tune in so you can hear about where we’ll be! Our Cosmo.ph team will be taking snapshots of girls in the city with the most fabulous #OOTDs, so make sure you dress to impress. We’ll also be going to clubs in Cebu for Cosmo Cocktail Hour on May 27. Chill and pre-game (open bar, anyone?) with us! Make sure you use the hashtags #cosmofunfearlesslifecebu #cosmostreetstyle and #cosmococktailhour for all of your posts, yes? At the main event, expect to meet the Cosmo editors and our handpicked fun, fearless females who are making waves in their own fields. Cosmo.ph EIC Jillian Gatcheco will be hosting the event and she will be joined by the queen of everything fun and fearless, Cosmopolitan Editorial Director Myrza Sison, who will be talking about the transformative power of beauty. Aside from our editors, the Cosmo team will be flying in renowned fashion and beauty photographer Shaira Luna, former Candy Magazine editor-in-chief and author of “In Case You Come Back” Marla Miniano, and celebrity stylist Kat Cruz (her clientele includes Kim Chiu and Nadine Lustre!). Expect Cosmo cocktails to be served throughout the event as you listen to these fun, fearless females who will talk about how through their passion, they never had to work another day in their lives. Wanna join in on the fun? Make sure to email us your name + four of your female friends through cosmorsvp@gmail.com with the subject COSMO FUN FEARLESS LIFE CEBU. Make sure to include your name, mobile, email, age, and the names of your friends. Shoot us an email before May 25, 5 p.m., and wait for our confirmation email. Print out the email, and bring your IDs on the day of the event. Follow us on FB, IG, and Twitter for event updates. See you in Cebu, CGs!